In a microdiscectomy or a microdecompression spine surgery, a small portion of the bone over the nerve root and/or disc material from under the nerve root is removed to relieve neural impingement and provide more room for the nerve to heal. A microdiscectomy spine surgery is typically performed for lumbar herniated disc. A microdiscectomy spine surgery is performed through a small (1 inch to 1 1/2 inch) incision in the midline of the low back. First, the back muscles (erector spinae) are lifted off the bony arch (lamina) of the spine. Since these back muscles run vertically, they can be moved out of the way rather than cut (see Figure 1). The surgeon is then able to enter the spine by removing a membrane over the nerve roots (ligamentum flavum), and uses either operating glasses (loupes) or an operating microscope to visualize the nerve root.Often, a small portion of the inside facet joint is removed both to facilitate access to the nerve root and to relieve pressure over the nerve. Importantly, since almost all of the joints, ligaments and muscles are left intact, a microdiscectomy spine surgery does not change the mechanical structure of the patient’s lower spine (lumbar spine). In general, if a patient’s leg pain due to a disc herniation is going to get better, it will do so in about six to twelve weeks. As long as the pain is tolerable and the patient can function adequately, it is usually advisable to postpone back surgery for a short period of time to see if the pain will resolve with conservative (non-surgical) treatment alone. If the leg pain does not get better with conservative treatments, then a microdiscectomy surgery is a reasonable option to relieve pressure on the nerve root and speed the healing. Immediate spine surgery is only necessary in cases of bowel/bladder incontinence (cauda equina syndrome) or progressive neurological deficits. It may also be reasonable to consider back surgery acutely if the leg pain is severe. Microdiscectomy spine surgery is typically recommended for patients who have experienced leg pain for at least six weeks and have not found sufficient pain relief with conservative treatment (such as oral steroids, NSAID’s, and physical therapy). However, after three to six months, the results of the spine surgery are not quite as favorable, so it is not generally advisable to postpone microdiscectomy surgery for a prolonged period of time (more than three to six months). Usually, a microdiscectomy spine surgery procedure is performed on an outpatient basis (with no overnight stay in the hospital) or with one overnight in the hospital. Post-operatively, patients may return to a normal level of daily activity quickly. Some spine surgeons restrict a patient from bending, lifting, or twisting for the first six weeks following surgery. However, since the patient’s back is mechanically the same, it is also reasonable to return to a normal level of functioning immediately following microdiscectomy spine surgery. There have been a couple of reports in the medical literature showing that immediate mobilization (return to normal activity) does not lead to an increase in recurrent lumbar herniated disc. The success rate for a microdiscectomy spine surgery is approximately 90% to 95%, although 5% to 10% of patients will develop a recurrent disc herniation at some point in the future. A recurrent disc herniation may occur directly after back surgery or many years later, although they are most common in the first three months after surgery. If the disc does herniate again, generally a revision microdiscectomy will be just as successful as the first operation. However, after a recurrence, the patient is at higher risk of further recurrences (15 to 20% chance). For patients with multiple herniated disc recurrences, a spine fusion surgery may be recommended to prevent further recurrences. Removing the entire disc space and fusing the level is the most common way to absolutely assure that no further disc herniations can occur. If the posterior facet joint is not compromised and other criteria are met, an artificial disc replacement may be considered. Recurrent herniated discs are not thought to be directly related to a patient’s activity, and probably have more to do with the fact that within some disc spaces there are multiple fragments of disc that can come out at a later date. Unfortunately, through a posterior microdiscectomy spine surgery approach, only about 5 to 7% of the disc space can be removed and most of the disc space cannot be visualized. Also, the hole in the disc space where the disc herniation occurs (annulotomy) probably never closes because the disc itself does not have a blood supply. Without a blood supply, the area does not heal or scar over. 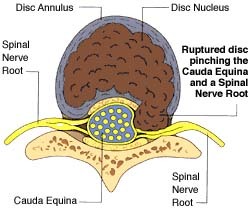 There also is no way to surgically repair the annulus (outer portion of the disc space). Following a microdiscectomy spine surgery, an exercise program of stretching, strengthening, and aerobic conditioning is recommended to help prevent recurrence of back pain or disc herniation. Dural tear (cerebrospinal fluid leak). This occurs in 1% to 2% of these surgeries, does not change the results of surgery, but post-operatively the patient may be asked to lay recumbent for one to two days to allow the leak to seal. However, the above complications for microdiscectomy spine surgery are quite rare.